Tierra Patagonia Adventure and Spa Hotel is located on the shores of Lake Sarmiento, with Paine Massif in the background, just outside of Torres del Paine National Park, Chile. 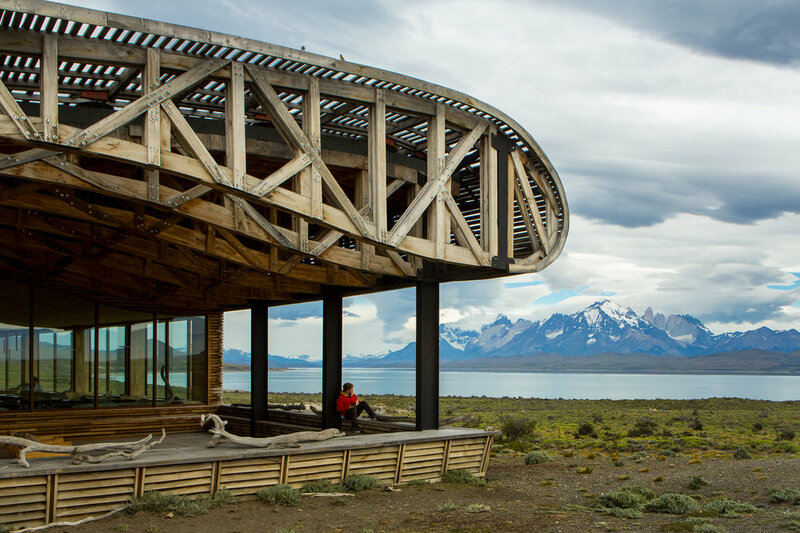 The landscape hotel seamlessly blends into its surroundings and is built like it was "shaped by the wind", inspired by Patagonia. Light is a major part of the design, bringing the outside in, with large windows facing the lake and the mountains. The glass-paneled Uma Spa is one of the highlights, complete with an indoor pool, a sauna, a steam room, and an open-air hot tub, perfect for nightly stargazing. Tierra Patagonia is in association with the Chilean Tourist Board and Forestry Association, supporting the reforestation project, aiming to plant one million trees across Chilean Patagonia. You are here to explore. Take a walk along the outer edges of Torres del Paine National Park, reserved especially for guests of Tierra Patagonia. Look out for sightings of eagles, foxes, ostrich (ñandú) and condors. Go horseback. Feel humbled by the Cordillera Paine and Sierra Baguales mountainscapes surrounding you. Take a photography tour to document the iconic peaks, glaciers, and mirror-glass lagoons. Tongabezi is a luxury safari lodge on the banks of Zambezi River, near Victoria Falls in Zambia. Surrounded by ebony trees and set against the basalt rock bed, the retreat consists of five houses and four river cottages, inspired by nature and built into their surroundings. Stay at the Tree House surrounded by indoor and outdoor trees or one of the River Cottages, complete with private decks overlooking the river. The Dog House is elevated and is constructed from three connecting decks with the river running underneath. Choose the Bird House for open-air bathtubs and a personal terrace for dining under the stars. The Garden House is perfect for families and set farther back from the river. Complete your Tongabezi experience with a one night stay on the remote Sindabezi Island. Tongabezi is truly for explorers. The activities are unique and plentiful. Discover the majestic Victoria Falls from a bird's eye view. Adrenaline junkies can do the Falls bungee jump or swim in the infamous Devil's Pool. Visit Mosi-oa-Tunya National Park, one of the Seven Natural Wonders of the World, where you can walk across Knife Edge bridge over cascading water. Learn about Zambia's history with a trip to the Livingston museum. Meet the children from the Tongabezi Trust School. Take an early morning game drive or even a daytrip to Chobe National Park in Botswana. You will find yourself at the most eastern part of Canada. Surrounded by jagged rocks and a powerful ocean, Fogo Island Inn is a perfect destination in itself. A beautifully designed hotel includes an award winning restaurant and twenty nine suites with floor to ceiling windows facing the North Atlantic Ocean. Most suites include wood stones and four-piece tubs. Do winter well with coastal or inland snow-shoeing, cross-country skiing, ice fishing, and caribou safari. Enjoy bird watching. Take a photo expedition along photographers from National Geographic. While taking a scenic train ride along the Hoang Lien Son Mountains, you realize you will be visiting a special place. Topas Ecolodge is a unique, welcoming lodge, built with the environment and the local villages in mind. Choose between 25 rustic chic bungalows, each with a private balcony and an unparalleled view. Overlooking Ban Ho village to the south and with the Hoang Lien mountain range in the background are the 9 Deluxe Bungalows. Overlooking Thanh Kim village to the north, with the Hoang Lien mountain range are the 16 Executive Bungalows. The balcony looks out to mountains, rivers, countryside and rice paddies. The scenery is ever changing - one minute you could see the mountains the next everything is covered in a mysterious mist. The lodge is located inside the Hoang Lien National Park, just outside Sapa town. The Park contains about 30 km2 of beautiful mountainous landscape, including Vietnam’s highest peak, Fansipan (3142m). The area is perfect for experiencing untouched nature by foot or on mountain bike, provided by the lodge. Explore the surroundings villages and rice paddy fields. L’Alyana is a luxury boutique resort on the Hon Heo peninsula in Nha Trang city in Vietnam. Surrounded by tropical woods, golden sand, clear blue sea and the picturesque Ninh Van bay, the hidden retreat is a perfect place to truly get away from it all. Enjoy 33 private pool villas, open to their surrounding environment, and mixing authentic Vietnamese architecture with contemporary eco design. Each villa is complete with a personal butler and views to the lagoon. Take advantage of the spa. Try a traditional Vietnamese detox treatment, using warmed glass cups. Or, choose a coconut, rice powder, or a green tea body scrub. L’Alyana has been named one of the best hotels in Asia in 2016 by TripAdvisor. Visit Nha Trang (a short complimentary boat ride away) and discover the real Vietnam. Hike to the Yang Bay Water Fall or sail to the Monkey Island. Go snorkeling in Hon Mun Marine Park. Take a bike tour along rice paddies. Hike the Jungle Rock or the Mountain Trail. Sign up with your email address to receive postcards from Room + Wild. Be the first to know about new hotel discoveries and special promotions.